Beijing isn’t in my immediate places-to-visit list. So, when dementedchris mentioned that food tripping was on the agenda during her Beijing vacation, I demanded asked her to guest blog. This is the first in a series of three posts. I’ve a feeling her adventures will convince you to visit Beijing. I know I was. To go food-tripping in a foreign country can be a challenge to any tongue, both because the dishes might be far from what your palate is used to or because, well, their names are just too hard to pronounce. My friend Oz and I survived dining in Beijing during our four-day trip, thanks to the presence of English menus, photos we could identify, and the ability to imagine what strung-up words on paper would taste like. We arrived in Beijing at around 11:15 am, still a little full from breakfast on the plane. But we knew we had to have something more in our tummies if we wanted to take on the Forbidden City. We needed food, fast. Oz and I headed towards Wangfujing Street, one of Beijing’s shopping districts and just a block away from Days Inn Forbidden City, where we were staying. There, we saw small snack carts peddling native delicacies sitting next to large commercial centers with their fast food restaurants. I zeroed in on KFC. 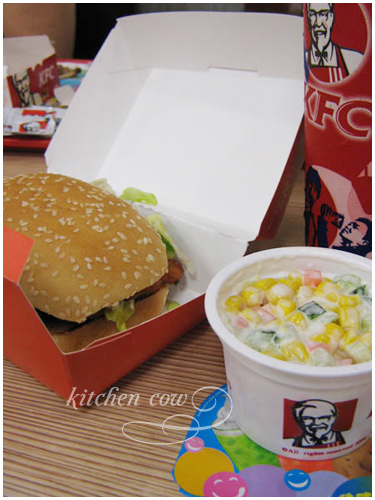 Confession time: I have a compulsion to visit a Kentucky Fried Chicken branch in every country I visit. 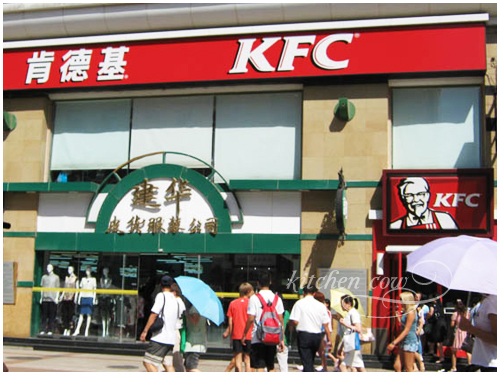 While I was planning the trip, I heard that the largest KFC was in Beijing and I knew I had to eat there. But in the rush of preparations, I forgot the exact address of the branch, and only knew that it was less than a kilometer away from Days Inn. Shouldn’t be hard to find, I figured. So was this the branch I was looking for? Far from it. Did I get a satisfying KFC fix? You bet. 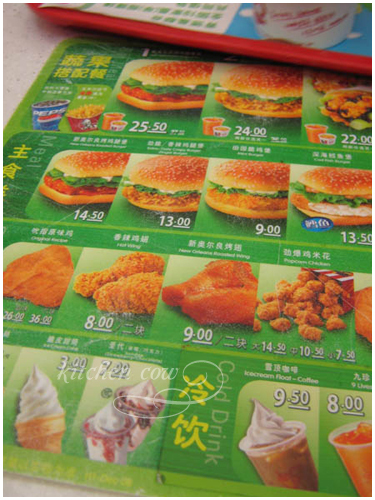 To make ordering a meal easier (I had zero skills in Mandarin outside of the standard guidebook phrases I memorized), I took a photo of the menu displays hanging behind the counter and just pointed to the one I liked. I didn’t know it then but I got a chicken sandwich with a sweet barbecue sauce. The meal, which came with a drink and a side dish of corn, carrots, and cucumbers, cost 25.50 RMB. 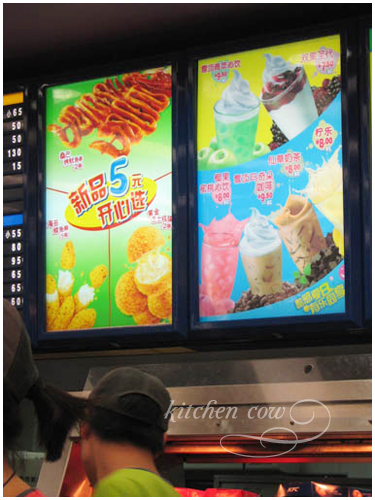 Is that bituka (intestines) on their menu board? I expected my sandwich to be a little spicy but I was wrong. Good thing, too, because I have low tolerance for spicy food. The side dish would not have been my first choice, but I liked how the sweetness of the corn tasted with the crunchy cucumbers. Meanwhile, Oz ordered the next value meal on the list, which was a crispy chicken burger. It was also paired with the same side dish I had. This entry was posted in food trips, guest blogs. Bookmark the permalink. I think this is an awesome guest series! Looking forward to the next part! So am I! I can’t wait for more. Oh, it wasn’t me who went to Beijing, it was my friend who’s guest blogging this series. I was just busy with work, unfortunately. My life=boring. Thanks for the comment Melissa. I’ll look into submitting. Unfortunately, it’ll probably have to be a different recipe as there’s none on this post.